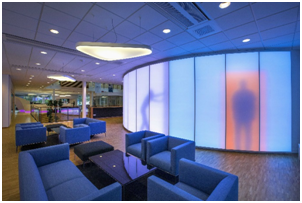 Powercor Blog » What are Luminous Textiles? Luminous Textiles created by Philips Lighting are a revolutionary new solution to enhance and enrich any interior space. Luminous textiles bring light, texture and content together to create a design statement that will be sure to impress!! Luminous textiles integrate multi-coloured LED’s within a textile panel, you are free to choose from multiple videos and multiple panels to suit your space. Another added bonus is how easy these are to install and control. All you need is a large enough space on a wall, a free plug socket and a bracket to mount it. Once the panel is installed it is controlled by a remote control or with a mobile phone or tablet. The images displayed can be selected from the Philips online portfolio or you can upload your own content through the special software to create a personalised panel. As a sensory experience it is like nothing you’ve ever seen before. The combination of the soft, diffused light and the aesthetics of the material create a distinctive effect that has an almost dreamlike feel to it. With total design freedom and completely customizable content, luminous textile makes the possibilities for mood creation endless. The soft texture of the panels also soothes the auditory senses. Unlike hard materials such as glass, concrete and steel that create acoustic problems, luminous textile helps to reduce noise and soften background sounds. By integrating 1 or more luminous textile panels into a retail environment customers are likely to browse for longer, and ultimately make a purchase. The panels create a welcome distraction when customers are waiting in queues for changing rooms and checkouts and create a calming setting. 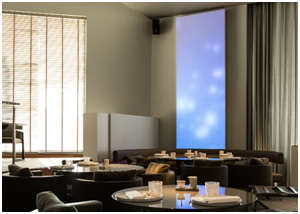 Luminous textile panels also look fantastic in hotels, bars and restaurants. By integrating panels into clubs and bars you can create a buzzing atmosphere with an image such as a party scene. These panels are also great in hospitals. The panels create a soothing and relaxing atmosphere which can help people to relax and ease anxiety about a hospital stay. They can also be incorporated into sensory rooms, creating a space where the user can get away from the hustle and bustle of everyday life to simply relax or stimulate the senses. The panels are available in a wide range of sizes and can be arranged in a way that best suits the surroundings. By placing numerous panels side by side you can create a breath-taking mood wall or you could scatter panels up a staircase. .As a Philips Lighting VAP (value added partner) we are able to supply and install these panels for you, please contact us if you would be interested in a quotation or some more information. Electric Car Chargers – What is all the hype? I joined Powercor back in 2008. Since then I have worked hard and progressed through the company and I have recently started a new role as ‘Operations Coordinator’. I love learning new things and working at Powercor, I seem to learn something new every day!